Pretty much every online business on the planet uses marketing automation in one way or another. Honestly, it would be tough to run a business without it. For example, if you were to sign up for my own newsletter, you’d receive a series of three welcome emails, one a day for three days. It makes total sense for me to automate that. And the user experience for people who sign up for my emails isn’t compromised one little bit. But … I’m a bit of a rarity. Because that’s pretty much as far as I go. Companies large and small are jumping into marketing automation with both feet. They’re loving it. And maximizing its use in every way possible. You get tagged. You’re tracked. You become fodder to the algorithms that drive marketing automation. You’re remarketed to. 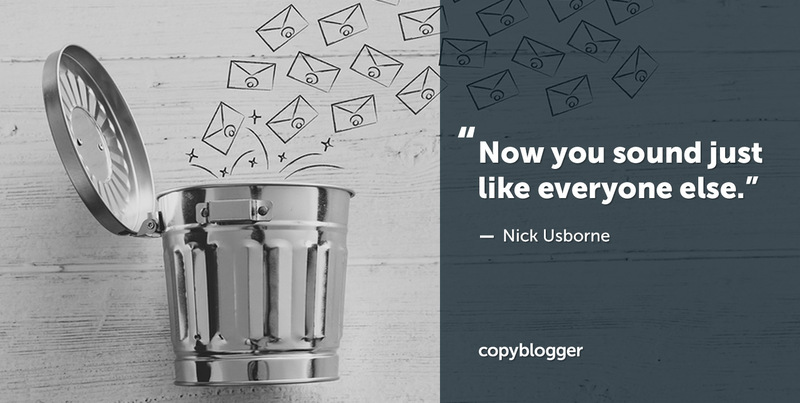 You’re stuffed into marketing funnels. But I’m biased for a good reason. I’m trying to defend the integrity of writing to your audience in a human voice. You can write the best copy or content in the world, and then have it badly undermined by the technology that delivers it. Let’s look at three cases of marketing automation mess-ups. When she wants to buy lingerie or swimwear, my wife has a favorite website she buys from. Recently she received an email from this company, featuring some items on sale. She clicked through to the site, took a look around and left. Didn’t buy anything or even put anything in the shopping cart. Just browsed a few items. Two minutes later … literally … she received an email. Seriously? They thought this would be viewed as a personalized experience? Cute, perhaps? Nobody thought it might sound creepy and invasive? Nobody paused to consider this might instantly undermine her trust in the company? Just because the features of the automation system you’re using allow you to do certain things, doesn’t mean you should do them. If you have even the tiniest suspicion that it might be a tad tone-deaf to send an email saying, “Caught you looking,” bounce the idea off some people who are not in your immediate team. More generally, be aware that your prospects and customers are thinking more about privacy issues than they were even a couple of years ago. And, like my wife, they’ll cut you off at the knees if they feel you’ve gone too far. I signed up for a newsletter a couple of months ago. I then received a series of welcome emails, each designed to bring me one step closer to buying the company’s course on digital marketing. Because the company specializes in digital marketing, I was surprised by something they said in one of their emails. They told me I could use only 140 characters of text in a tweet. Oops. Twitter changed that limit to 280 characters back in late 2017. In other words, that automated email sequence has been “in the can” for more than a year, and nobody had thought to update it. Again, this is a fast way to undermine the trust of your readers. There’s nothing creepy or bad about this example. It’s just an oversight that can be avoided. Don’t “can it and forget it.” Set a schedule to go back and read all of your automated emails. You may be embarrassed to discover some of them were written literally years ago and are in urgent need of an update or refresh. Look for factual errors, like the number of characters allowed in a tweet. But also look for things like cultural references that can age quickly. Or maybe your voice as a business has evolved, and that new voice needs to be reflected in those old email sequences. I’m sure you’ve had the experience of being stuck in a marketing funnel. You might sign up for a webinar, download a free report, or register for a video call. Whatever the entry point, you’re now in the funnel. Emails, landing pages, sign-up pages, more emails, and so on. Again, nothing fundamentally wrong with that. But when you move your prospects through one of these funnels, you’re doing exactly the same thing as most of your competitors. Everyone is doing it, and for the most part they’re using the same marketing automation service providers. And this means your audience has been exposed to the “funnel experience” a few times now. They pretty much know what the next message is going to be about. And they know when they’ll be hit with your breathless message of urgency or scarcity. The process and rhythm of your cunning plan is familiar to them. But when you deliver your copy within the predictable structure of an automated sequence, that sense of humanity quickly evaporates. Your brand takes a hit too. Because now you sound just like everyone else. Add something unexpected to every email sequence. A personal note. A reference to something that happened in the news yesterday. Do the same with your social media channels. Particularly if those channels are automated too. Throw in something timely. Respond to comments. Join the conversation! You can use automation technology and also break the rhythm with some real human interaction to have a far better chance of holding your audience’s attention. The kind of automation I’ve been writing about here is pretty old-school. No new tech required. It would take a whole new post to start exploring the benefits and dangers of replacing human interaction with an AI-powered chatbot. Why waste time paying real people to talk with your prospects and customers? Why not have a bot do it for you? Let computers do what computers do best. And let humans do what humans do best. Computers are good at automating things. But humans are really good at being spontaneous, imperfect, unpredictable, and on a good day, inspirational. Come to think of it, that’s not such a bad closing thought for this post too. By all means, use marketing automation tools. But don’t let the process undermine the power of great writing. And make it a little messy. Computers and automation are good for some things. However, one thing computers will never do is replace the human approach toward the marketing message. Marketing through computer automation is more like having a world full of robotic marketers. IMHO, that will never happen. Human marketers need paying jobs to support the global economy. Computerized robotic marketers have no need for monetary payment. Yep, I’ve “been caught looking” – at your great post. I enjoy reading what you write, mostly because you break me free from the “just-blast-lots-of-folks” mentality that I still see in tons of copy, training material, offer emails, etc. Even my insurance agent has stopped blasting me – and I prepay that bill! Now she calls and we chat for a couple of minutes. And she stays cool if I let her know I’m busy. But I have a question – How does conversational copywriting replace the “4 U’s” in a headline? I’m not sure I can answer that question very well. First, I can’t say I’m a huge fan of things like “The 4 U’s”. Feels like writing by numbers to me. That said, I see no conflict here if you want to apply the 4 U’s and be conversational at the same time. No conflict there at all. Great article, Nick! I’ve personally encountered so many marketing automation fails. One newsletter I’m subscribed to repeats my first name twice in all emails. I hate that… when marketers insert my first name within the body of the text. Automation masquerading as genuine personalization! There are so many little details to watch for. If we start depending too much on the “auto” part and ignore the “responder” part of the word, our content will surely go stale. Despite all automation that makes life easier for a business, the human involvement cannot be ruled out. The “tone deaf” thing is a particular peeve of mine. Copywriters need to watch out for these, and help clients see that what’s “cute” or “playful” to some can come across as creepy or worse to customers. It’s not about playing it safe as much as about making completely sure you know how your message is landing with the audience you care about. Indeed… Sometimes it feels like marketers pay way too much attention to the “Automation Optimization Handbook”. Demonstrating your ability to spy on me by saying “Caught you looking”, is not a smart use of automation. Instead of building trust, it burns it. Thank you, Nick. I wholeheartedly agree. I have been on both ends of this situation, especially when dealing with clients that only want to do automation. Like most things, I think you need to have a balance. When you don’t keep up and care about your clients, it reflects poorly on your entire brand. Keeping in the conversation on as many mediums as possible shows that you are there for more than just the money. Nick, I find it highly creepy that the lingerie company would say, “Caught you looking” in an email to anyone. I would have unsubscribed as well. They sound like a bunch of stalkers! They should follow your advice to read your copy to your grandmother. I’m sure that one wouldn’t have passed the grandma test! I think we are feeling stalked by the technology. If you take one look at a product on Amazon, ads for it follow you everywhere. Also, the endless sales funnels! There needs to be some human intervention in there somewhere. I find it very off-putting as a consumer. It is so intrusive! Great post! Glad you liked it. : ) And yes, a little human intervention always helps. Copywriting is like humor, it always sounds better coming out of a human. In all serious automation can be a great help in marketing but people are starting to become over-reliant on it. When the same patterns emerge in marketing because of computer created or computer-aided content it looks creepy, like you said. It is creepy, because we instinctively know that there’s something “off” about an automated process pretending to be human. Thank you, Nick. This gave me some important new awarenesses. I’m grateful! Great insight, I think it is important to remember that content for people should always be written by people. Automation is a great tool, but at the end of the day that human touch is what makes the difference. Agreed. Too much reliance on the tools and automation can seriously dilute that human touch.